Douglas Adams is a famed science fiction writer of books and radio plays but that’s not all he did. He ventured into the very early world of video games. Specifically text adventure games with Hitchhiker’s Guide to the Galaxy the Game and Bureaucracy. He did make one more game before his death. 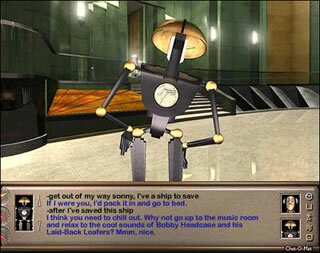 A 3D point-and-click adventure game entitled Starship Titanic. Starship Titanic is about you the play because well, you’re never given a name. The very bottom of an immense galactic cruise liner crashes into your house. Totally wrecked. Then a robot comes out and informs you that the ship that cannot go wrong has well, gone wrong. Not wrong but rather insane and the ship needs you to help fix it. If you are a fan of Douglas Adams, you can tell that a plot like this has his name written all over it. Starship Titanic is really a series of logic puzzles and trying to communicate with the crew. Actually, a little bit into the game I went and printed out a guide. If you use a guide, the game play is drastically shortened. There is not a large amount of content in the game but rather the puzzles are so difficult they make the game long. Some puzzles are easer then others but in reality, if I had not gotten a guide, I would be playing Starship Titanic for a long time. The puzzles themselves may seem odd to some but truly there puzzles you would find in a text adventure game. A lot of this game, fans of text adventure games will notice, is that it’s built like a text adventure. You could say that about all point and click game because of the way you move around but that’s not it. The way you speak to crew is remarkably a lot like a text adventure. 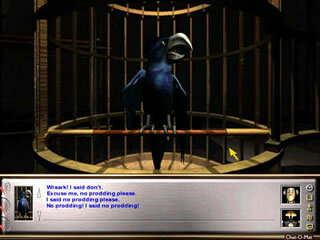 Actually, a conversation engine was created just for this game called Spookitalk. Other evidence of text adventure game play, as I have said before, are the puzzles. Must have an item you picked up awhile ago to complete this or you have to turn these switches in a certain order. Being a Douglas Adams game, it also has a unique sense of humour. For those who are not familiar or dislike text adventure games, you will find this game hard, difficult, and rather tedious, which is its downfall. Starship Titanic came out in 1998. By that time the text adventure game was dead and people were looking to FPS games. Perhaps Digital Village and Douglas Adams wanted one more go at it with text adventure games. Infocom was dead and buried by now and lost. Starship Titanic is a game that is overlooked. This game is as close to you’ll get to really feel like you’re in one of Adam’s books which is a great thing and this game is pretty close. However the game does fall with its old-age type puzzles, lack of direction sometimes, and the troublesome conversation engine. Those are all the problems of text adventure games. That’s the problem! Starship Titanic was trying to be like a text adventure game with graphics but not fixing any of the past problems for a new generation. In closing words, Starship Titanic is interactive fiction with graphics and animations. If you’re new or dislike interactive fiction, stay away from this game. If you’re a text adventure gamer, make this game at the top of your priority list because it’ll provide some retro entertainment and have you laughing for hours on end.